Description: Come early spring Snow Plants push through the snow cover in the upper mountain forests. Due to lack of green leaves Snow Plants do not photosynthesize, instead they absorbs nutrients from the surrounding decaying organic matter. Height: 6 - 12 in. 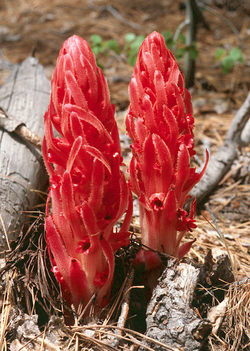 Note: The Snow Plant is federally protected and anyone caught disturbing this plant is subject to a $500 fine.